2) For good crackling ( the crispy skin on top of the roast !) : make sure the skin is very dry before you cook it. Score the skin before roasting – this allows the fat from underneath to bubble up, crisping the skin as it does so. Use a very sharp kitchen knife and, taking care not to go through to the flesh, make incisions 1cm apart. 4) Place the meat on your roast dish that comes with the oven and cover it with Silver foil . I first cook the Pork with Silver foil for 30 mins so that the heat and moisture does not escape and the heat cooks the meat from inside out. The silver foil prevents the meat to get roasted too fast from the outside and inside is still not cooked and also it retains the moisture so that the meat is not to dry. 5) Knowing when pork is cooked: pierce the centre of meat from the underside of the joint with a fine skewer. There should be no traces of pink left in the juices. Clear juices indicate the pork is sufficiently cooked, but that the meat will still be beautifully moist. 6) Remove all the excess salt and then slice up the pork when it cools down. You can eat it as is or if you have left over you can use it to make sandwiches it tastes amazing .. 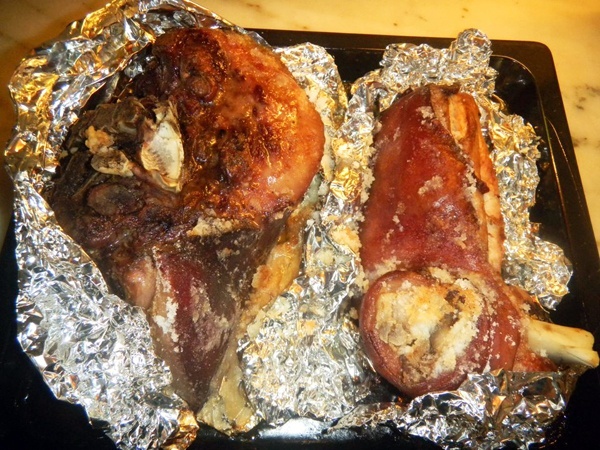 This entry was posted in Pork and tagged Roast Pork by Kamakshi. Bookmark the permalink.